Colour gives a document greater impact and improves readability. However, to make a really good impression, the colours in a document must always be reproduced consistently. Corporate Identity guidelines also demand consistent and precise reproduction of colour schemes for company logos, for example, irrespective of the output system. The Color Profiler is an important tool for achieving absolutely precise colour consistency. This is done with the aid of ICC standard profiles, which can be used on all Develop colour systems equipped with a Fiery controller. A spectral photometer and positioning aids are included in the scope of delivery with the soft­ware. Unlike a basic densitometer, a spectral photometer can recognise colour tones and thus measure special colours, for example. Creation of ICC profiles: With the generation of ICC profiles, this colour management tool matches the settings of scanners, digital cameras, monitors and printers. This ensures that an original document read in using any input device can be reproduced accurat­ely on any output device. With the new Profile Inspector, profiles can be compared and represented in 3D. They can then be adapted using another new tool, the Profile Editor. Calibration of Develop systems: The ES-1000 spectral photometer is a fast, easy-to-use colour calibrator that is connected to the computer via a USB interface. Because the ES-1000 is addressed directly by the calibration module of the normal Fiery software, it can also be used as a densitometer to record fluct­uat­ions in colour reproduction for calibration purposes. It is available both with and without a UV filter. The UV filter is recommended when using paper with optical brightener. This can be done with a Fiery controller and is partic­ularly useful for work during the pre-press stage. The spectral photo­­meter calibrates the colours for the Fiery module “Spot-On”. With the new Color Verifier, colour values can be measured and compared based on their deviations. Monitor calibration for soft-proofing: The documents can be checked on the screen (soft-proofing) after the monitor has been calibrated. To ensure consistent colour quality, output systems require regular calibration. 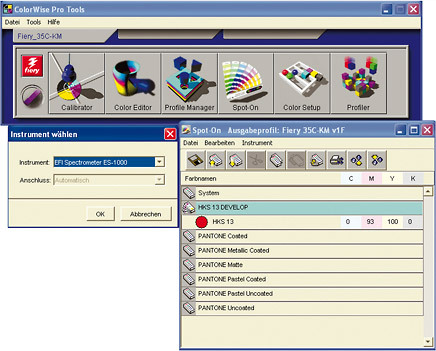 The Color Profiler also lets you create and save high-quality ICC profiles as well as spot colours. Moreover, version 2 provides instruments for profile evaluation and quality control.